As genealogists we are always looking for more information on our ancestors and our veterans in order to ferret out our family history - our story! So when we are introduced to one more repository, especially one that has an online presence of information and photos, we, at a3Genealogy, want to share. 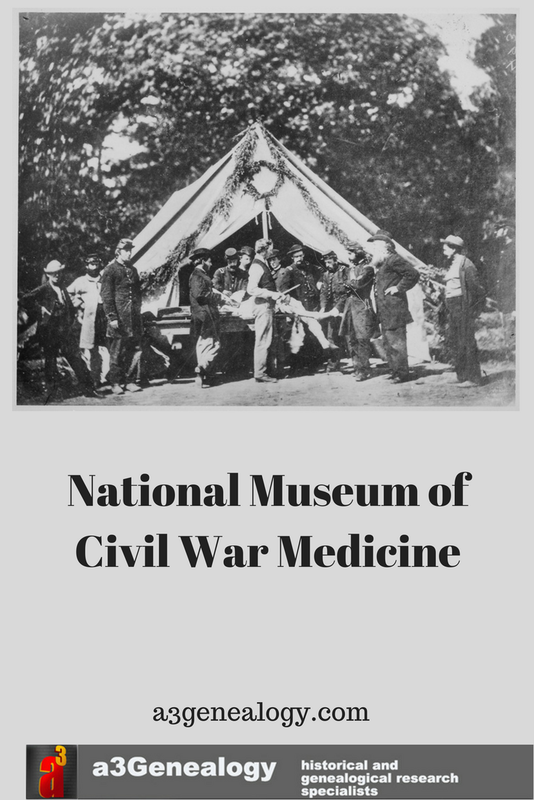 Have you perused the National Museum of Civil War Medicine website? The National Museum of Civil War Medicine “focuses on the many aspects of Civil War medicine, including surgeons, nurses, patients, medicines, diseases, and hospitals.” We know Union surgeons treated more than 400,000 wounded men; about 245,000 of them for gunshot or artillery wounds, and performed at least 40,000 operations. At the beginning of the war there were 113 surgeons in the US Army, but by the war’s end, there were more than twelve thousand surgeons in the Union and 3200 in the Confederate. In each of the content areas mentioned - Surgeons, Nurses and Women, Soldiers - research begins with the National Archives of Records Administration, D. C. (NARA - Archives I) collections. Be sure to check the online digitized resources of ancestry.com, fold3.com and other free and subscription databases. At the beginning of the war there were approximately 600 women serving as nurses in 12 hospitals. By the end of the war, over 2000 nurses had served. The actual number is not known. Review the pension records for Union nurses. “Women of the War; Their Heroism and Self-Sacrifice” written by Frank Moore (1866). This name-based search may yield photos or other artifacts of an ancestor. This Research Center has an impressive collection of books, and artifacts.. These books may assist the researcher in understanding the referenced wounds and disease mentioned in medical / pension files. 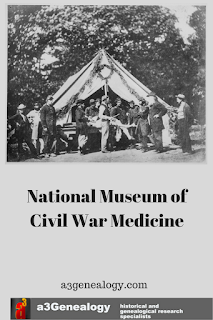 It is well known (see video) that there were at least 12 African American surgeons or assistant surgeons serving in the Union Army. Most were educated overseas or in Canada. These records are best found in service and pension records. Using the key word “colored” four “Person Records” accompanied with photos popped up. Joel Morse, born in OH in 1823, his spouse Lucy Maria Sprague and children were named. Joel, a surgeon for the 117th Regiment of the USTC was murdered in Texas in 1866. These are the common names known to most researchers. 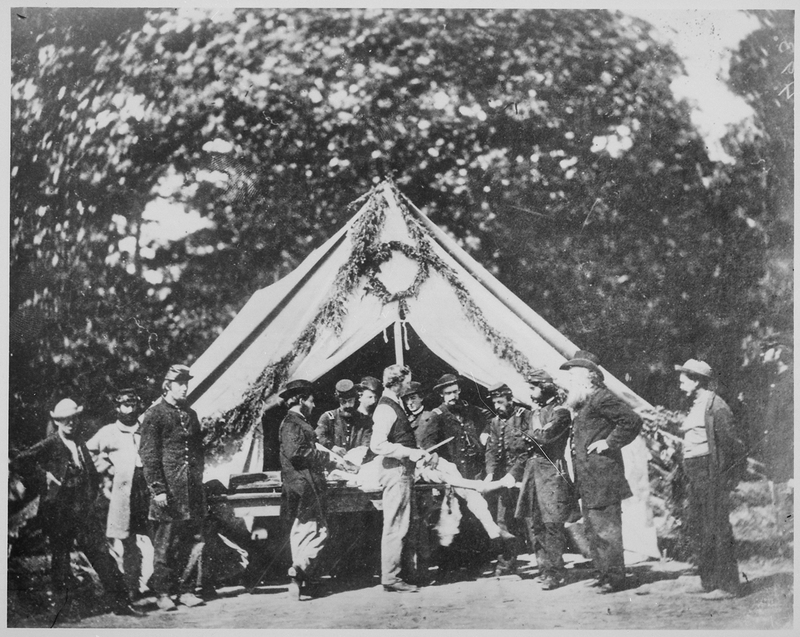 However, few can name the African American doctors who served soldiers in the Civil War. Be sure to read Prologue to Change: African Americans in Medicine in the Civil War Era. Be sure to also review U. S. Army Heritage and Education Center, at Carlisle Barracks. The Civil War Photographs Database is populated with just shy of 27,000 photographs. U. S. National Library of Medicine offers Maimed Men as an informative resource.